2016 Ford Fusion Energi For Sale In Vernon, Kelowna, Okanagan, BC. Bring your driving experience to the next level through the efficient 2016 Ford Fusion Energi. Beautiful interior design will excite you as you connect through innovative technology in a smooth and safe way. Comfortable seats hold you firmly in place as you activate the advanced lithium-Ion battery and electric motor with a gasoline engine. Exterior design boasts of agility and control with an aerodynamic build and motion enhancing features. You have the option between the Ford Fusion Energi SE, and the Ford Fusion Energi Titanium. When you step foot into the 2016 Ford Fusion Energi, you will be met with an intense display of comfort and innovation. The 10-way power driver’s seat with power lumbar and 6-way power passenger seat are just the beginning when it comes to customized comfort. 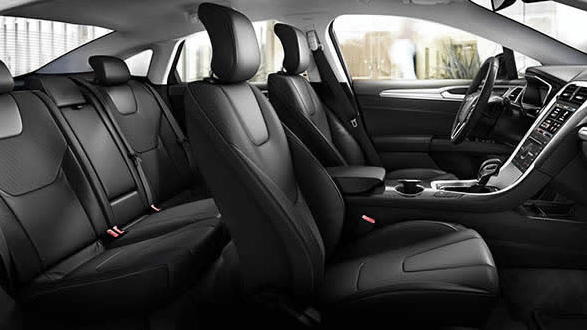 The available leather and heated bucket seats bring every drive to a new level of luxury, as you fight off colder mornings with ease. Sporty features are found everywhere as you grip the leather shift knob or leather-wrapped steering wheel and feel the power of traction control. Mounted cruise and audio controls enable you to conveniently and safely adjust your settings without distraction. Offer a climate to your passengers that suits their needs, even if they differ from yours through the technology of the dual-zone electronic automatic temperature control. MyFord Mobile is a mobile app that was designed for the Fusion Energi and helps you monitor and schedule the charging of your car while on the go. Remote status updates are made available, as well as information on the nearest charging stations. The available voice-activated navigation system guides you to your destination through voice commands for a safe and focused delivery. Bring along the gear you need with the flexible cargo space of the 60/40 fold-down seats. Bold, smooth edges contour the exterior design of the 2016 Ford Fusion Energi and allow you to drive with agility and performance. The aerodynamic build, complete with available rear spoiler, offers efficiency and motion enhancing good looks. Bring dominance to the road with the unique chrome grille and body-coloured features. Through the integrated headlamps, LED taillamps and available fog lights, you can increase your visibility and provide a clear indication of your presence on the road. lithium-Ion battery and electric motor with a gasoline engine. This advanced technology offers an all-electric mode for short commutes as well as a traditional gas-electric hybrid function when more power is required. Drive with agility and efficiency in the vehicle that works for you through features such as the regenerative braking system and a CVT automatic transmission. This system takes the kinetic energy that is often lost through heat friction when braking and recovers more than 90 percent to store for later use. Drive the car that has everyone talking with the 2016 Ford Fusion Energi. Drive in confidence with the vast array of safety features that have your back while you drive the 2016 Ford Fusion Energi. 2016 Ford Fusion Energi For Sale In Vernon, Kelowna, Okanagan Valley, B.C. When you require more from your automobile, it can be difficult to find something that does not require you to compromise on non-negotiable items. The 2016 Ford Fusion Energi offers a different perspective when it comes to driving, understanding the need to have it all. With power that regenerates itself and hybrid options to give you flexible reliability, you are able to drive with freedom and a clear conscience. Refined touched are found both inside and out and you experience the road in a vehicle that is prepared to offer you luxury, connectivity and functionality. See the 2016 Ford Fusion Energi for yourself at your local Okanagan Valley Ford Dealer - Watkin Motors Ford. Learn more about hybrid technology or other advanced features when you take this Ford model for a test drive. Stop by Watkin Motors Ford and drive home a new car today.